I hesitate to let him go. dreams, the tragedy of a moment lost, an a anthem of some place we’ve never been. I’m flattered. Thank you. I appreciate the kind words. Likes and comments are always welcome. I hope your weekend is one to write about. What a beautiful compliment. Thank you. 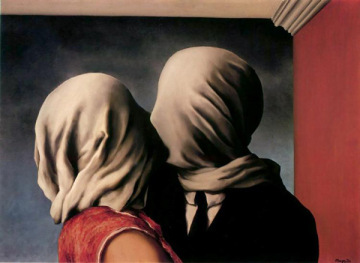 This poem is so elegant and emotional, and great on pairing it with Rene Magritte’s art, it’s one of my favorite paintings from my favorite artist. Your word choice is so good, unique, and never fails to be interesting, emotional yet clever. “Michelangelo has left the chapel”. That tickled me. Great Piece Tosha. and says I wear him well” is just brilliant. We don’t even call them shrimps. Just swear a lot and act drunk. You’l be fine. Of course, there’s a little more to it than that. You also have to go about in a hat with wine corks hanging all around the brim from little pieces of string because absolutely everybody down here wears those all the time. Excellent well written poem Tosha. 🙂 Beautifully done. Excellent. I’ll have to use organic butter “Earth Balance”. Is that okay with you? 🙂 hahaha!!! So beautiful. Breathtaking! 💙 I love how creative you are! Beautiful and elegant, just like you, my friend! This is poetry dear Poet. The above lines perfect and true. People shall leave destine places for the glory of love and appreciation. Outstanding poetry by a amazing writer. Please read and enjoy her work. I had too. A amazing poem. A lesson in the words. You are welcome Tosha Michelle. Somehow I was no longer following you, WP does strange things! I know. It’s been working my last nerve. Lovely and evocative. Words painted with meaning… Thank you.